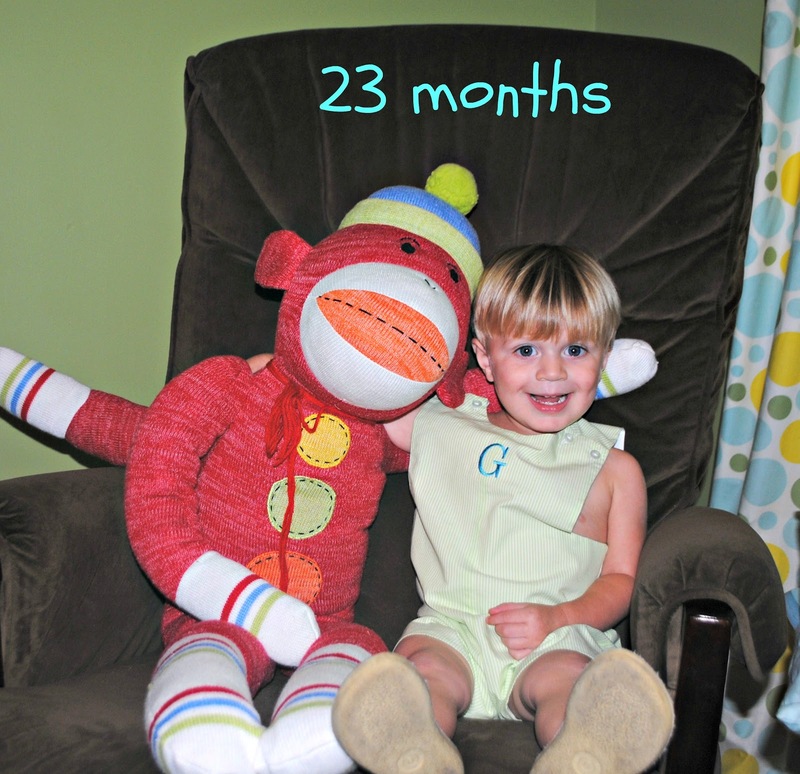 Moments with the Mays: G is 23 months old! Grayson is 23 months old today! All of a sudden G is so big & I can't even believe he is turning TWO next month. I feel like we were just planning his 1st birthday party. PSA: when they tell you that your kids will grow up TOO FAST? They mean it. Weight: somewhere between 22 & 23lbs...still a tiny little guy! Height: around 33 inches? we find out next month! G is talking up a storm! He can pretty much say anything & we have to be really careful about what we say in front of him. He is a sponge & repeats everything! He is starting to connect words together. The other day I told him that his friend Reed was going over to play & he picked up his phone and said, "Hey Reed! See you soon!" I can't wait until he can really talk in sentences...I am always trying to figure out exactly what he means when he says something! G is branching out a little more with food. He is a little more willing to try things recently. His newest foods he will eat are watermelon, oranges, baked beans, & Laughing Cow cheese on crackers. Grayson became a BIG BROTHER over the past month! G is so sweet with Griffin. He is always saying "hey baby!" and giving him kisses. When Griffin cries he insists that we let him have his monkey lovie. It matches G's froggies & I love that he thinks the monkey will cheer up Griffin! All of a sudden Grayson is obsessed with tools. He has a little tool kit & he walks around the downstairs "fixing" everything. It's so funny! We have entered into the "mine" phase. So, that's not very fun. We are really working on the whole sharing thing. This too shall pass. This month was a huge one in the life of our almost 2 year old. A lot of changes took place & I was really worried about how G would adjust. He is used to being the center of attention & being on the go a lot. Well, he has done so much better than I expected! Grayson really hasn't shown any signs of jealousy towards Griffin yet & I hope that trend continues. He ignores Griffin most of the time (because let's face it, Griffin sleeps like 20 hours a day) but it also really sweet with him. I am so proud of him! I feel like he literally became a big boy overnight. He is so independent now & while it's helpful, it makes me a little sad. G is growing up so fast! I can't believe that it has been almost 2 years since our first baby was born. That is unreal. It's crazy how fast time goes by! Grayson is at such a challenging age right now but it is also so much fun. He has so much personality & keeps us laughing! Happy almost birthday Grayson! Jax has always been small too. 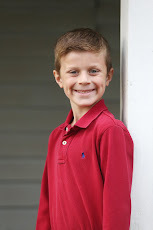 We have a bunch of 2t shorts and shirts from last summer that he's been wearing this summer. And I'm certain that his 3t stuff from this year will still fit him next year. At least the clothes get a lot of use! Can't wait to hear about party planning and birthday fun for G! AAAWWW...happy 23 month birthday Grayson!!!! I'm so glad to hear he is adjusting so well to Griffin's arrival...what a sweet boy!!! And yes, the time is going by two fast...Addie will be 2 in October and its making me crazy to realize how quickly the time has flown by!! What a sweet big brother Grayson is! He just looks like a happy little guy! And I can't believe he's still in 12m shorts - didn't you say Griffin is smaller than Grayson by a pound or more? I know the time goes by fast and you probably feel like it's on fast forward now with two. But I hope you have fun planning his birthday party!